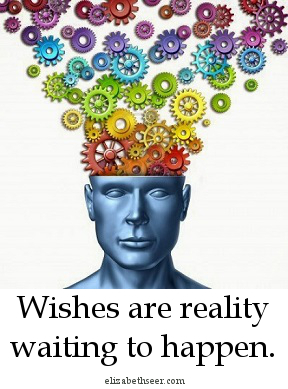 Wishes are reality waiting to happen. When we place our LOVING focus on a certain situation, person, or object, we can bring it to our own reality. This reality should never be forced (as in forcing your will upon another). A wished-for reality, with real substance, is brought about through a loving knowledge that it will come into existence. Anxiety, doubt and fear do not make wishes come true. This process should bring happiness and joy to the dreamer even as their world must change to make room for the wish. create your reality, manifest, manifest desires, manifest dreams, manifest wishes, manifestation, wish your reality. Bookmark.